Impinj Speedway Revolution - 2-Port, GX2, UHF POE Fixed Reader. Does not include power supply or power cord. For use in China, Korea, and South Africa. RF interference, tag quantity, ambient RF noise, and even building materials near an RFID installation all affect system performance. Most users configure their readers for worst case scenarios, often compromising best performance in the process. With the Impinj Speedway Revolution"s Autopilot, innovative firmware features work together, automatically optimizing the reader operation to its environment while delivering peak performance at all times. 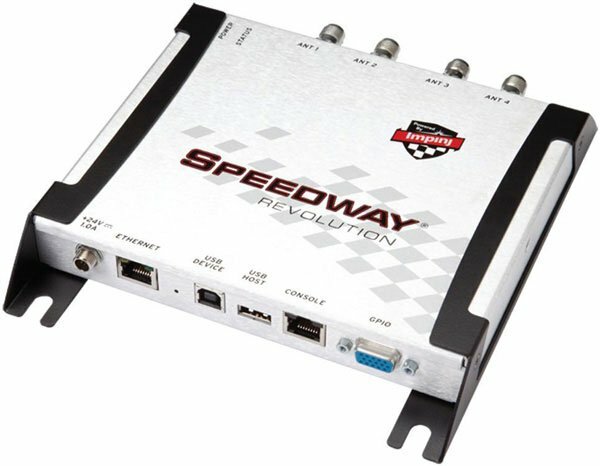 The Speedway Revolution also delivers increased application flexibility via support for Power over Ethernet (PoE), which simplifies deployment and dramatically reduces cost by eliminating the need for AC outlet installation at read points. This revolutionary RFID reader improves upon the advanced hardware capabilities that made the original Speedway the reader of choice for many demanding customers and highlights capabilities such as best receive sensitivity, interference rejection, and item-level carrier cancellation. SMA to R-TNC cable 13 ft., For use with Guardwall, Mini-Guardrail, Matchbox, and Threshold antennas). RFID Antenna, UHF, FCC, 10.1 x 10.1 x 1.4 inches, Far Field, Indoor, Right-Hand Polarized, Includes 8 ft. Pigtail Cable. AC Power cord, US, Compatible with Impinj. AC Power cord (UK, Singapore, Malaysia, Hong Kong). The Impinj IPJ-REV-R220-GX22M1 is also known as IPJ-REV-R220-GX22M1	or IPJREVR220GX22M1	.